Sometimes, on a first visit to a dog, it is apparent that they must have been in pain or uncomfortable for some time. The configuration of their body or the tension in their muscles didn’t just come on overnight. Spasms and strains in dogs do happen but they typically occur suddenly and, with appropriate help, ease off quickly. These are acute issues. Putting up with it is often a chronic issue. Anyone who has ever had a dog knows how stoic they can be. They don’t seem to want to show their discomfort. When living with their humans, they just want to get on with being their best friend, accompanying us on our walks, following us round the house and generally being with us wherever we are, even if it means they ache. Our job, as therapists, is to try and identify the issue and help to ease or break that pain cycle. Pain doesn’t have to be due to the things you see or know about, like arthritis. It can be something equally insidious which you just don’t notice as your dog has been putting up with it for so long. We know that 4 in 5 senior dogs suffer from arthritis but that leaves many seniors and younger dogs who could be suffering with something else which can also be helped by physical therapy. Let’s not forget them. Handsome Spaniel Lord Nelson, for example, was likely kept crated or in a single room for a while before he was rehomed. He even had to be taught how to walk in the outdoors as his legs were so underused. When his new Dads were alerted to the hunched shape of his spine they started therapy with us. Working with the carer and the dog, we felt our way through all his physical issues helping to put them right again. Feedback like that means the world. With the new eyes that his Dads have regarding his mobility, gait and physicality, and maintenance therapy visits from us, they will have to put up with him being a happy healthy family member, an-all round trouble-making demanding stubborn boy. Lord Nelson, meanwhile, won’t have to put up with living with his discomfort. And as a P.S. I was reminded by his Dad of the all important poo details – he always had to lean on a tree to do his business but now he can squat like all self respecting Spaniel boys. How long did Lord Nelson have to put up with that? Clearly he knew it wasn’t right, but he had to put up with it. No more PoohGate for Lord Nelson. 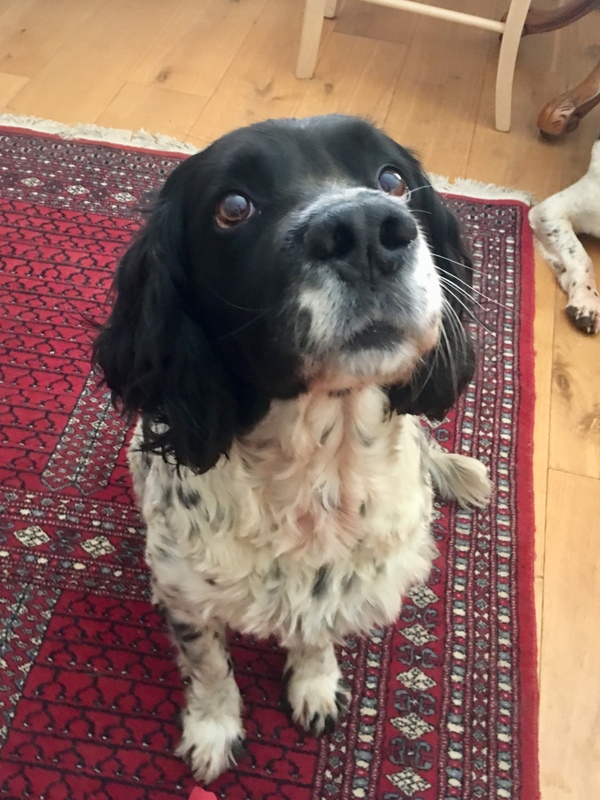 This entry was posted in acheypaw, achy paws, AchyPaw, achypaw myotherapy, Brighton Dog Massage, canine myotherapy, canine myotherapy, dog myotherapy, achypaw myotherapy, myotherapy, achy paws, Dog, dog myotherapy, injury prevention, massage benefits, muscle spasms, not just arthritis, south coast dog massage, south coast myotherapy, Sussex, Testimonial, therapeutic massage and tagged acheypaw, achy paws, achypaw, achypaw myotherapy, achypaws, canine arthritis management, Canine massage, Dog massage, injury prevention, not just arthritis, prevention, south coast, south coast dog massage, south coast myotherapy, therapeutic massage, www.achypaws.com. Bookmark the permalink.